Popular blogger and self-taught decorator Myquillyn Smith (The Nester) is all about embracing reality—especially when it comes to decorating a home bursting with boys, pets, and all the unpredictable messes of life.In The Nesting Place, Myquillyn shares the secrets of decorating for real people—and it has nothing to do with creating a flawless look to wow your guests. It has everything to do with embracing the natural imperfection and chaos of daily living.Drawing on her years of experience creating beauty in her 13 different homes, Myquillyn will show you how to think differently about the true purpose of your home and simply and creatively tailor it to reflect you and your unique style—without breaking the bank or stressing over comparisons. 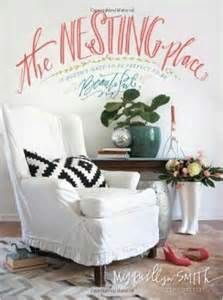 Full of easy tips, simple steps, and practical advice, The Nesting Place will give you the courage to take risks with your home and transform it into a place that’s inviting and warm for family and friends.There is beauty in the lived-in and loved-on and just-about-used-up, Myquillyn says, and welcoming that imperfection wholeheartedly just might be the most freeing thing you’ll ever do. This book was a book I chose to review based on the cover. I know that people say to not judge a book by its cover, but the cover had a beautiful white chair perfect for reading which made me want to read the book. At first, when I started reading this book it did not catch my interest, but that was not because of what the book was about but because of the format of the e-book. This put my reading of this book on hold because I just could not get into this book. I recently seen it again when I was checking for what books I need to review and I thought that I would give it another chance. I read this book in about an hour and a half. I really liked Myquillyn’s concept of accepting that everything is not going to be perfect in your home. This really hit me because I would love to have a home like I see in magazines, but I know that it won’t happen because those home’s are not really lived in. They are staged to make them look perfect which people want, but in all reality fatigue from work sets in and no one really wants to hang up the clothes that they just took off to put on their pajamas. This book has many great tips on how to not worry about what is going to be “messed up”, but instead try things out so that you do not wonder about the “what-ifs”. One example she mentioned was the people that always tell you about “good wood” and how if you paint that wooden piece of furniture that it won’t work and it will just ruin that piece of furniture. I knew exactly what she was talking about because this is my Dad’s side of the family. They are always worried about ruining the wood so when she mentioned this it hit home. Myquillyn helps teach in this book about how not to worry about the little stuff and to take risks with that $5 table that has been sitting in the garage for 2 years. This was a great book and I give it a 5 out of 5 stars. I received this book in exchange for my review from BookLook bloggers.